When you’re trying your best to eat healthy, some days you just need an ace-in-the-hole; a place you can go where you know that every single thing on the menu will be a good decision. For me that place is Lifefood Organic on Cahuenga and Sunset. Nestled in a bustling neighborhood that is fast becoming one of my favorite in Hollywood, Lifefood Organic is a health market, a restaurant, and a spa all rolled into one. Stop in to get lunch, stock up on supplements and raw snacks, get your B12 shot, and continue on with your day – it’s no joke. I only ever come here for the food (big surprise), but if I had lots of money to spend I could totally see myself trying all their natural snacks and supplements. What I love about their menu is that literally everything is vegan, gluten-free, and raw. So if I’m in need of a sandwich fix, but I’m not in a place where I can go all out for a traditional sub, or if I just need to eat some food that I know will make me feel fantastic, this is where I go. Pictured here is my go-to, their falafel wrap, which again is entirely vegan and gluten free and comes with some sort of heavenly green dipping sauce (no idea what it is, all I know is that it’s delicious and I eat all of it). I have also had their pad thai – my friend Brett swears by it. You get all the textures and flavors you expect from Pad thai without ever missing the meat or egg. It’s like vegan magic. 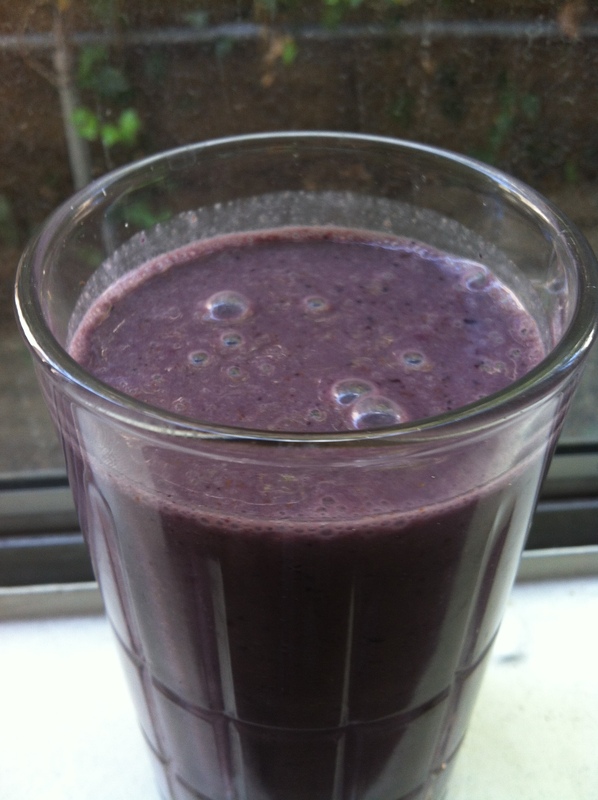 They also are a full juice and smoothie bar and even serve vegan ice cream – mmm! Now I can’t lie, with food this good and this natural, you know it isn’t going to be cheap. This wrap is $13 – worth it both for the flavor and the mental satisfaction, but it is by no means starving artist friendly. And I actually went home after this and ate a salad – lol! Still, it’s a fantastic treat when you’re in the mood to eat out but not in the mood for temptation, conflict, or self-loathing. If clean eating is your thing, then you won’t be disappointed by Lifefood Organic. Beyond the 5 freeway towards Pasadena lies a mystical land called Eagle Rock. Charming, hipster, and increasingly trendy, it’s a fun little place filled with lots of unique little boutiques and restaurants that I always remember I’m dying to try when I drive through. This past week I got to one of them – Four Cafe on Colorado Blvd, a fully organic restaurant boasting seasonal dishes made from exclusively local-bought ingredients. Structured like many restaurants are in Los Angeles these days, you order at the counter, pay, then take a number and your food is brought to you. I’m not sure how I feel about this apparent fad in restaurant dining, but I guess I don’t have much choice. Besides, I’m a big fan of the earth-toned decor in this place. Rustic wooden tables, earthy wall treatments, plenty of outdoor seating, and an absurdly friendly girl behind the counter who had thorough knowledge of everything she was selling and was more than happy to chat us up about it – big points there. Nothing more attractive than a place that is proud about what they serve. Now when one hears that a restaurant is fully organic and local, it can often lead to thoughts of boredom and salad and… vegans. But such is not the case at Four Cafe. Yes, there is plenty to choose from if you’re a vegan or gluten free, but they also have items like the short rib grilled cheese made with braised short ribs, gruyere, onion, and horseradish, served on foccacia. My friend Kevin got this and was not at all disappointed. A quick peruse of yelp and you can find huge praise for their fish burger, house-made with fresh mahi mahi served on a brioche bun. My mouth waters just typing this. But on the day I visited I was not super hungry, so I opted for a bowl of soup. For those of you trying to watch your weight, soup is always a good go-to in restaurants, particularly when they are house made and vegan like they are here. Supremely earthy and satisfying with just enough wild rice to add a pop of texture. It warms you up and makes you feel good about yourself for making such a good decision. In fact I felt so good that I opted for one of their vegan gingersnap cookies. Moist, spicy, and absolutely delicious. I deserved it. On my list of things to try are the fish burger (of course) and the roasted veggie root salad, which comes with a chili mint dressing. Also – brown butter apple pop tarts!!! Mmmm. I have to say, I love when a restaurant like this isn’t afraid to have some indulgent food along side all their vegan local wholesome creations. It shows they aren’t pretentious – they really want to attract everyone, which is really important for a starving artist. Sometimes I want vegan soup, and sometimes I want an apple pop tart. I think what gets me about these “take-a-number” kind of places is that at the end of the day I don’t feel like I’m saving any money by not having to tip a waiter. My bowl of soup and cookie came to $10.36. Worth it, yes, but I know if I had gotten a full salad or sandwich I would have been well over $15, which is not really a starving artist friendly kind of lunch. But in this case I’m ok with it because for one I know the ingredients are of the highest quality, and for another I am getting a meal that I can feel really good about eating. Let’s face it, eating out healthy is not cheap, but a place like Four Cafe is your best bet for getting a good healthy bang for your buck. So, if you find yourself in Eagle Rock in the mood for a meal you can feel really good about (or a short rib grilled cheese!! ), then definitely give Four Cafe a try. So I mentioned last week I was going on retreat with GMCLA in Malibu. Did you really think the starving artist would make a hike up the PCH into Malibu without indulging in some great seafood? No no. 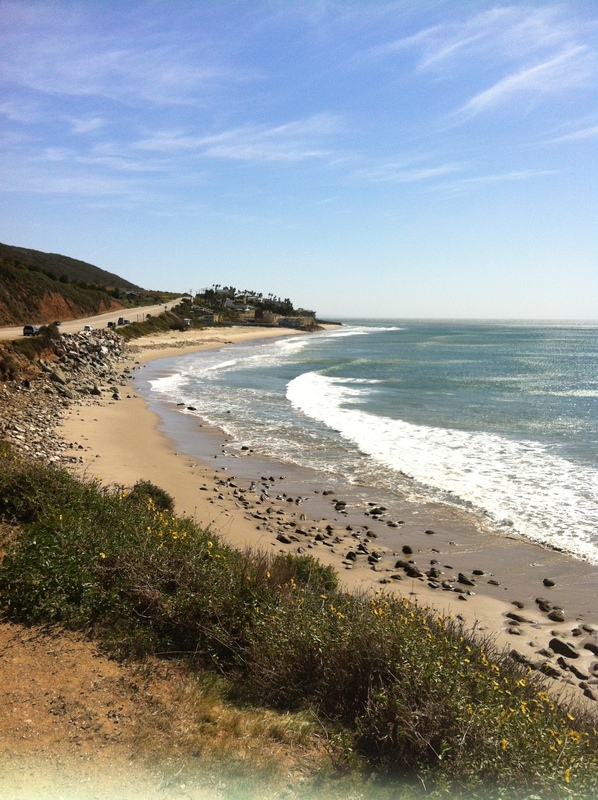 On Sunday morning two of my chorus friends and I were determined to get some beach time in before we headed back to real life, so we wandered out the camp ground, across the highway, and spent a bit of time basking in the glory of the alarmingly windy Malibu coast. Glorious. As we turned back we saw Neptune’s Net, a precious little beachside fish restaurant, staring at us from across the way. I had seen it on the way in (impossible to miss) and of course had been intrigued. We decided that even though the food at the campground had been quite good, it was worth at least a stop in to see what was going on. Like any good beach-side seafood joint, Neptune’s Net is more of a shack than anything else. Plastic chairs and picnic tables outdoors, no-frills booths with self service on the inside, no shirts required, lots of motorcycles, colorful clientele, and real fresh-caught fish…. we must be on the beach. And we were. As if the atmosphere wasn’t enough, I looked at the menu and saw fish and chips for $9.95 – hesitation? no. Any quality seafood one can find for less than $10 is a treasure, but when I saw these fish and chips come out I was giddy. Why? The traditional/English way of doing fish and chips uses a thick batter, often made with beer, that coats the fish and creates a solid, crispy, cocoon-like shell around the fish. Where I’m from (Boston, baby!) we do the fish with a flour coating. It gives it a thin and crispy exterior – much lighter than a beer batter. Neptune’s Net makes it light and crispy. Not sure exactly what their breading is (not just simply flour), but whatever it was I looooovvvved it. Fresh fish, amazing crust. Took me home. Though I have to confess, their fries were a bit under cooked – gotta make ‘em crunchy, Neptune! I also tried the clam chowder, which was unfortunately way too thick to be taken seriously. My friend David went for shrimp tacos, which were excellent and served with a yogurt sauce reminiscent of Tzatziki: very fresh and very california. Honestly, eating seafood at the beach on a day like this one? There’s just no way I wouldn’t be happy. But it definitely helps that Neptune’s Net is totally affordable, totally fresh, and totally rad. I can’t wait to come back up here with a car full of friends when I’m in need of a beach-and-seafood fix. Starving artist heaven! Some weeks ago, in the midst of the bitter Los Angeles winter (ha), my friend Sherri and I decided to combat the cold by seeking out some warm, soul filling Thai food. Sherri suggested an adorable little place in her neck of the woods called Leela Thai, a quaint little shack-of-a-place on Silverlake Blvd that has an exterior brimming with foliage and quirk. The restaurant’s dining room is cozy, barely big enough for 20 people. Luckily the Los Angeles cold keeps the natives at home, so we were practically the only ones in there (which was admittedly still a little strange for a Friday night). It’s hard to get a read on the atmosphere with so few people in the place, but I can say that the family-run business absolutely felt that way with their warm and friendly staff. I was particularly enamored with their unique table dressings. 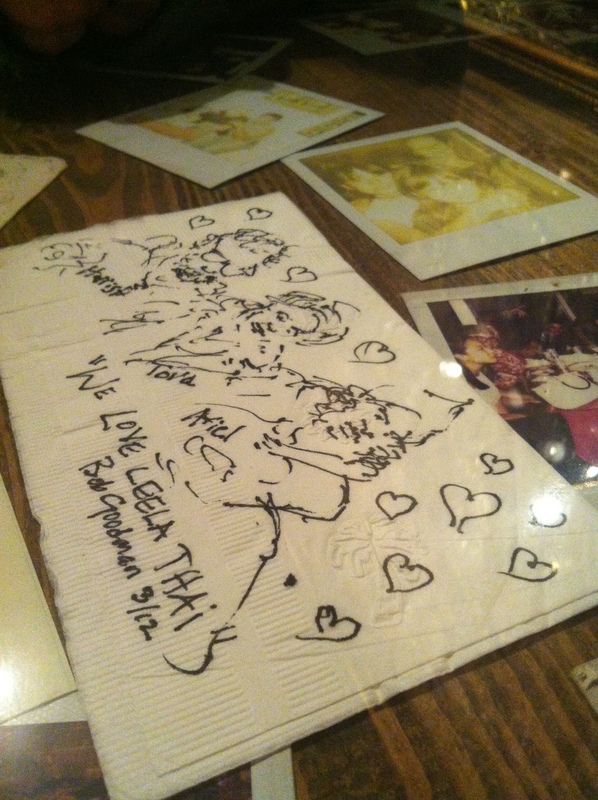 Instead of just plain glass, they lined each table with handwritten notes, old polaroids, and various other memorabilia from customers and family members. A very colorful touch to what would be an otherwise nondescript dining area. As for food. 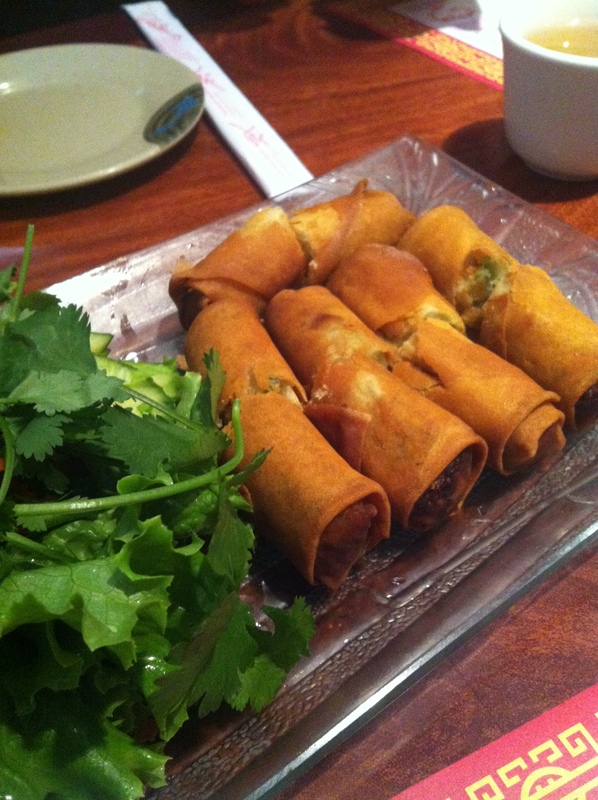 We shared the vegetarian spring rolls, which were hot and delicious – easily could have railed through another order. I had their wonton soup, which was very well done and absolutely perfect for such a cold evening. For my entree I ordered a shrimp combo meal, which comes with rice (and allows you to add soup for only $2). Though tasty, it was not exactly what I was hoping for. A very scant portion of clumsily chopped vegetables and a few shrimp that really had to be combined with all the rice to make a substantial meal. However, a place that will serve brown rice without charging me extra for it always scores mega points in my book. Sherri got the pad thai, which they fouled up on the first pass by adding chicken (she is a vegetarian). The mistake was fixed quickly and with a smile – always a good thing. At the end of the day we were able to enjoy a meal with appetizers and soup for less than $30, which is never a bad thing for the always wallet-deficient starving artist. Though a quiet restaurant can be suspicious, it is always good for catch up and gossip, of which there was plenty. While I was not completely blown away by my experience here, I do look forward to returning when I’m in the mood for some cheap, decent thai food in a quaint and intimate setting.